Get PhP5,000.00 off a new Hurom Slow Juicer HA Series if you trade in your old juicer of any brand. Hurom elevates juicing to a new level. Hurom slow juicers gently squeeze fruits and vegetables, nuts and grains to preserve their natural taste and nutrition, color, and flavor. There are no sharp edges or whirring blades, just pure nutritious deliciousness. Unlike commercial juices, Hurom juice is full of live, digestive enzymes. Make it a habit to drink to health and grab a Hurom juicer now. This is the second (2nd) year in a row that Hurom is doing their Slow Juicer Trade-In Promo. Last year’s campaign was so successful that Hurom has decided to do it again. The public who missed out last year have a chance to take advantage of this deal. The customer can trade in any brand of juicer, in whatever condition, to any Hurom representative at participating stores: Rustan’s, SM, Landmark, Anson’s, Abenson, True Value, SM Appliance Center. 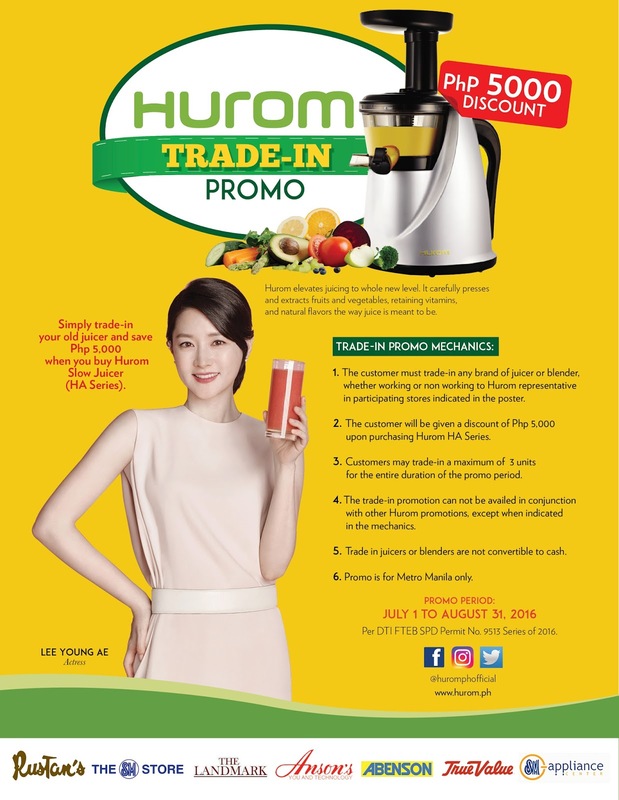 The customer will be given a PhP5,000.00 discount upon purchase of the Hurom Slow Juicer - HA series. Customers can trade in a maximum of three (3) units for the entire duration of the promo period. The trade-in promotion cannot be availed in conjunction with other Hurom promotions except where indicated. The trade in juicers and blenders are not convertible to cash. Promo Period is from July 1-August 31, 2016.